On behalf of the Crossroads Unit we extend a warm welcome to our newest member: Rebecca Arredondo. She became a Provisional Member on Monday, March 23, 2015 during our General Membership meeting. 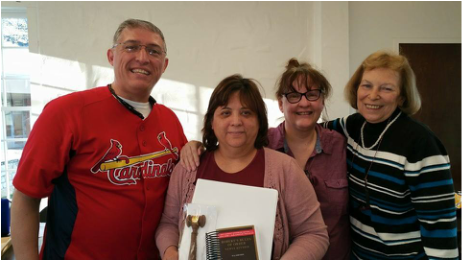 In the picture from left to right: David Perez Hurley, Treasurer, Rebecca Arredondo, Patricia Munoz-Elizondo, Secretary, and Sue Bruns, Executive Member. Rebecca Arredondo, as you continue to be a part of our family, you will discover our energy, thirst for RONR, and collective wealth of professional, knowledgeable people. It is our sincere wish you will enjoy your time with us! From The Crossroads Unit Team!